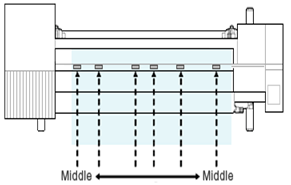 Home | FAQ | What is the appropriate pressure for the pinch roller in print mode? Ex.) When setting up the 1300mm-width media on CJV30-130 with 6 pinch-roller operation. – Setup all the pressures in M (Middle). * Make in-between pinch roller distance equivalent to ensure smooth feeding of the media. The pinch rollers may leave the roller tracks on certain types of media. Adjust right pressure depending on your media. Also note that try to adjust the pressures on right half and left half even to prevent media meandering.